These are some of the photographs of the wildlife that I came across whilst I was out in Zambia locating ground water sources for the local Villages. I was on my own when I took these photograph and as you can see in some cases I was only a few feet away. 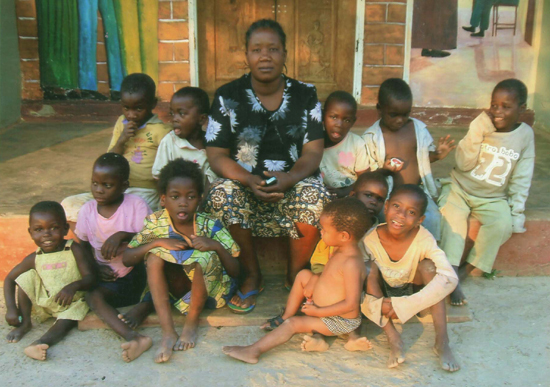 Each year Peter freely volunteers two weeks of his own time in Zambia paying for it from his own funds. While there he uses his skills to pinpoint the precise location for the wells to be dug. Below you will see details of work carried out during the last visit in 2007/8. 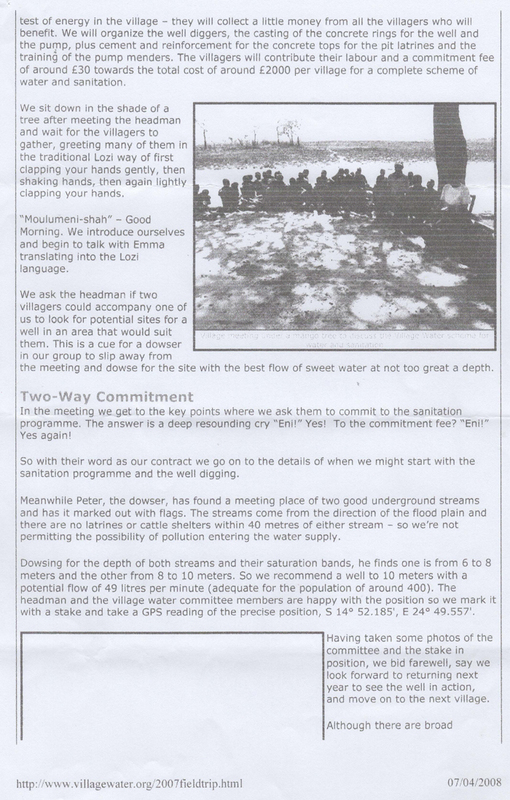 Permission has been given by village water to share these photos with you. 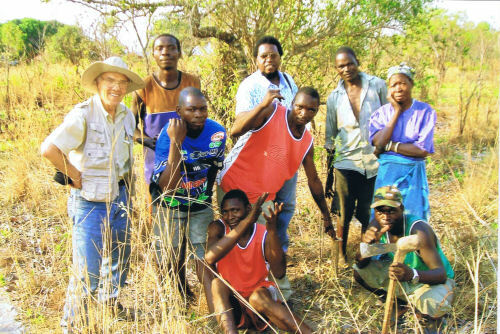 Much of the work done in Zambia is made possible by dowsers and diviners who freely volunteer their time and pay their own airfares and expenses to travel to Zambia to do this work. You can read Peter's 2008 trip report here. These photos were taken in the western province in 2007 & 2008. Some towns will be mentioned but if people are interested in following up the photograph locations then it could be a good idea for them to contact www.villagewater.org who I am sure will be quite happy to help. Our project schedule was to locate a minimum of 3 sites per day, each day, apart from Sundays, we were starting from sunrise to sunset. 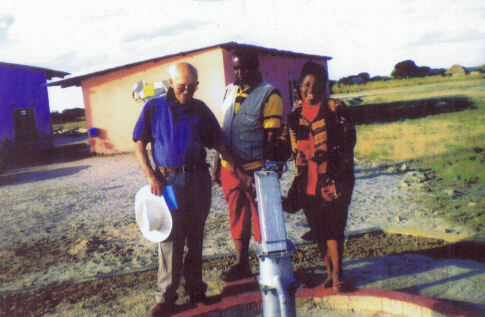 The well at Kaoma school is still providing water for the 300 children. 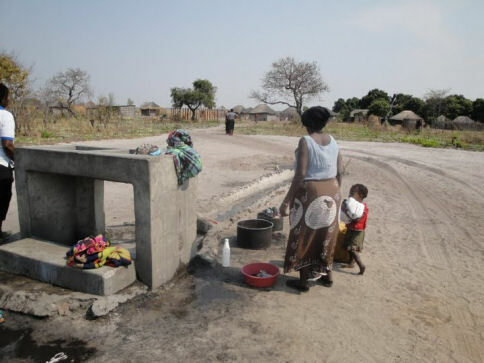 This year it also provided for the whole town of Kaoma, when the town water supply ran dry. In this photo we see dowser John Baines, together with Teddy and his wife, who set up the school. In the foreground is the well, and behind them the school buildings. 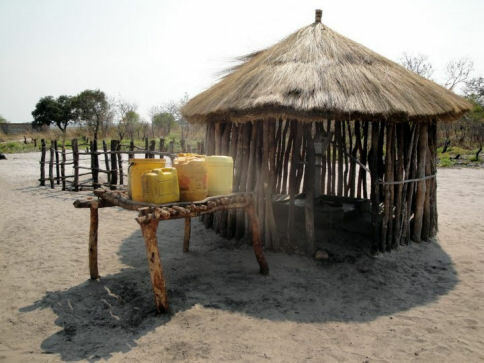 Many of the villages have no well at all - the villagers carry water to the village from distant water holes. 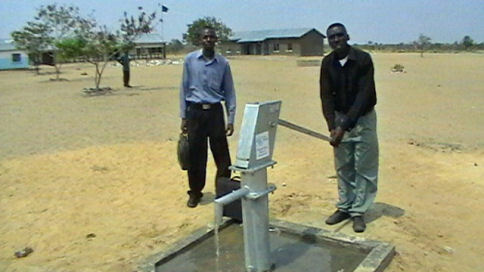 Having a well installed in the village can make a massive difference to the lives of the villagers. Peter helps to locate the water, and checks previously installed wells. 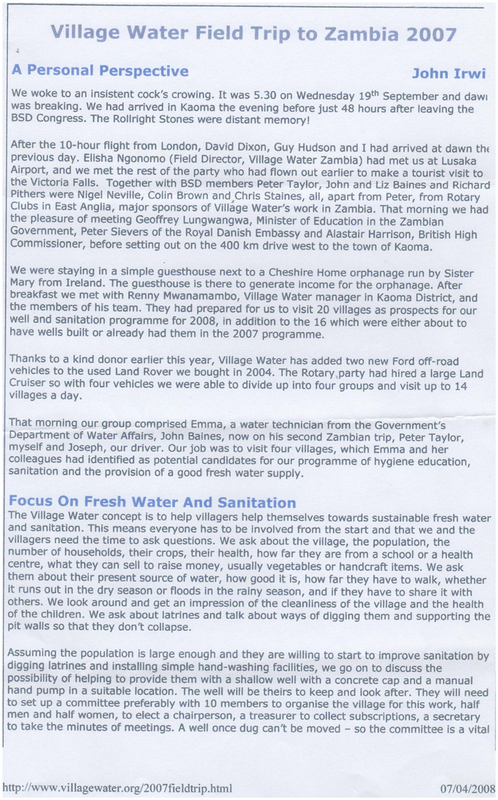 the Village Water Charity organisation. 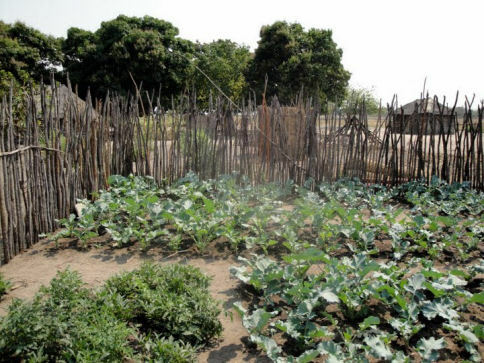 The people there were starving because they did not have water to grow their crops. This shows the new laundry area in Kandiana Malala where the villagers can now wash their clothes, the water runs away to a soak away seen in the foreground. To the left you can see yellow canisters of water; these are taken from the well which is located away from the laundry. 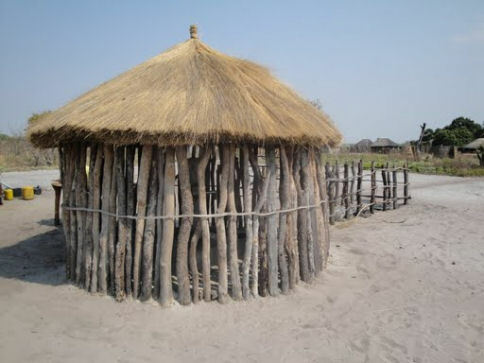 This shows the protection around the well to keep the animals away and keep the well hygienic. On the right you can see the stakes extending out from the main shelter, this is to protect the run off from the well. 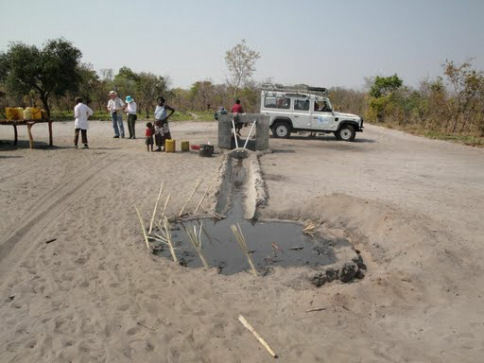 The well is located away from the village, and with very little in the way of tools the villagers cleared away all the scrub between the well and the village leaving the area clear. This is another photo of the washing area showing the slab where the clothes are washed and the runoff, the village is in the distance. This is a view of the well from the other side - you can see the outline of the well in the shelter. As a result of the well dysentery is now a rare occurrence in the village - in removing disease the well has been truly life saving. Here are the crops that the villagers have been able to grow as a direct result of the well installed for their village by Village Water. 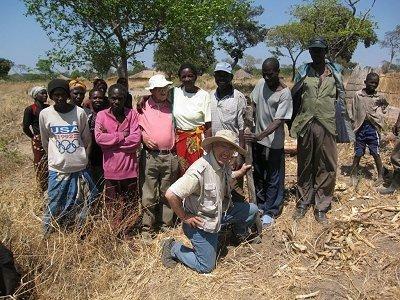 Peter Taylor map dowsed for the location of this underground water before he even set off for Zambia - this saves him time in the field. Before Village water arrived this school had mains water for only 4 hours a day - the water was switched off at 12 midday. Here we see John Irwin of Village Water talking via an interpreter to the local sanitation advisor. The school is assembled at the well opening ceremony, they are thanking village water for the well and the sanitation advice given. Here is the well at Senanga ready to be fenced in. 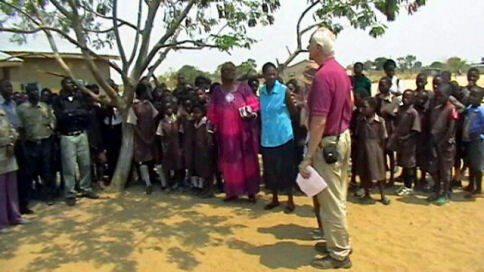 Here the school staff gather around the well. In Zambia all schools are painted blue and white - the school buildings can be seen here on the right. 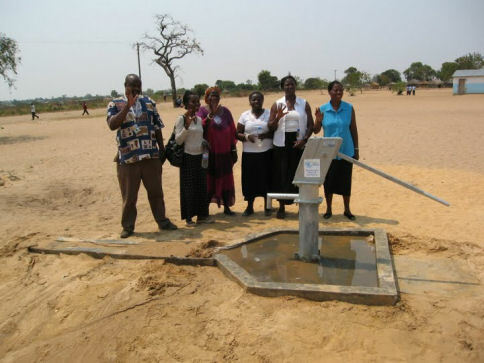 Village Water is a charitable organisation based in the UK who employ people in Zambia to locate the outlying villages in need of water and sanitation. They use local well diggers to dig out and create the wells. Up until 2009 they used to have volunteer dowsers, like Peter, from the UK to give their time and go with them to the western province. 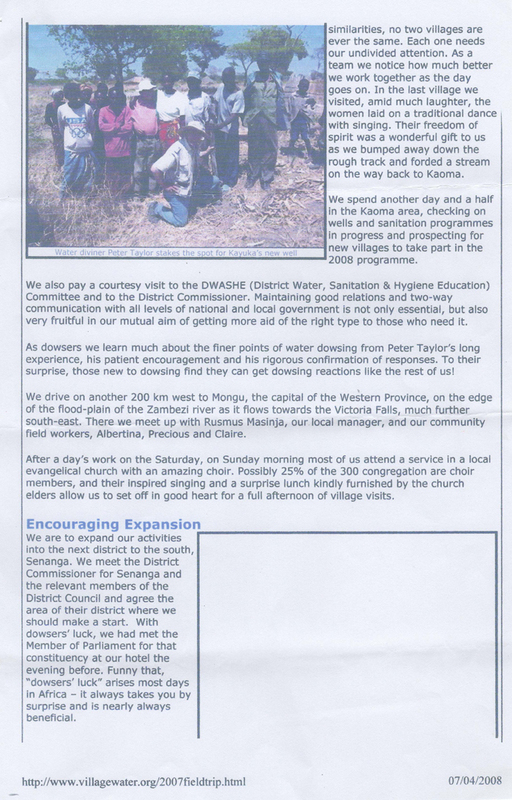 However, in 2009, Village Water decided to train and use local well diggers to carry out the dowsing work. This means that the people are more self sufficient and will be able to locate water all year round. 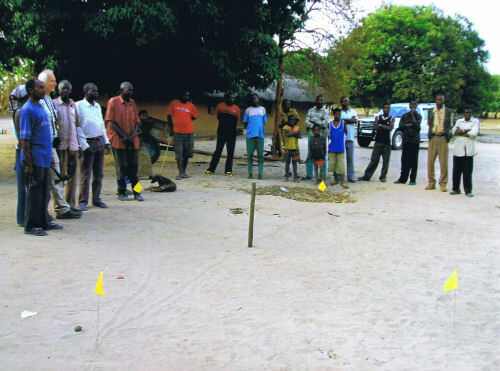 It also means that they can utilise the art of dowsing in Zambia. 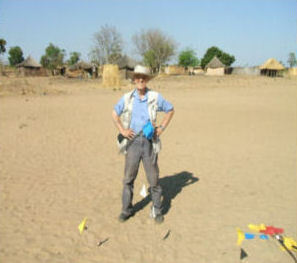 Peter still intends to go back to Zambia to continue to support the local people by locating water sites.